Instant Imprints Sugar Land, TX | Custom T-Shirts, Embroidery, Signs and More! At Instant Imprints Sugar Land, our customers come to us when they want to be more visible to their customers. We create that visibility five different ways: Branded Apparel (embroidery), Signs & Banners, Promotional Products, Custom T-Shirts and Print Services. Is your brand looking to expand its visibility with custom t-shirts, printing services, promotional products, custom banners or branded embroidery items? Then Instant Imprints in Sugar Land is the promotional partner for you! We have the latest production techniques and we know how to use them to help you make your goals happen. Our Texas Image Experts are at-the-ready to answer any questions you may have and help you create the perfect promotional item. Just ask your phone next time you’re in town, “Where’s the best print shop near me?” and you’ll find us! At Instant Imprints in Sugar Land, we pride ourselves in providing a superior service to our customers. That means we get your job done right the first time, with quick turnarounds. Instant Imprints combines the expertise of a brand leader with the local touch that only a Sugar Land Image Expert can provide. Your project is made with expert care, from start to finish under one roof. Custom t-shirts are a great way to spread your brand visibility across Sugar Land and beyond. With a variety of production processes available, you can use the right method to match your needs. If you have any questions about which production style is right for your project, our Image Experts are happy to help you choose the promotional path that’s right for you. Shirts from Instant Imprints are sure to turn heads, wherever they’re found! When businesses in Texas want to stand tall, they turn to custom signs and banners from Instant Imprints. Our custom signs give you the power to be unique in a big way, whether you’re looking to reach prospective customers on the sidewalks or the freeways. Roll-up banners give you the flexibility to take your logo wherever it can serve your business best, and sidewalk signs can be a personable way to invite in passersby from the street. 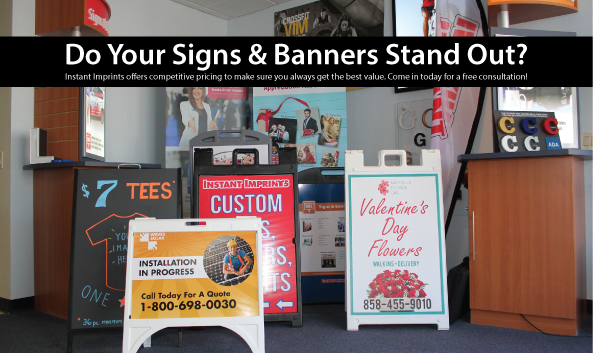 No matter what your promotional goals are, there’s a custom sign or banner solution for you! When you’re ready to take your brand visibility and style to the next level, stop in at our Sugar Land Showroom, give us a call at (281) 240-5925 or request a quote online today.